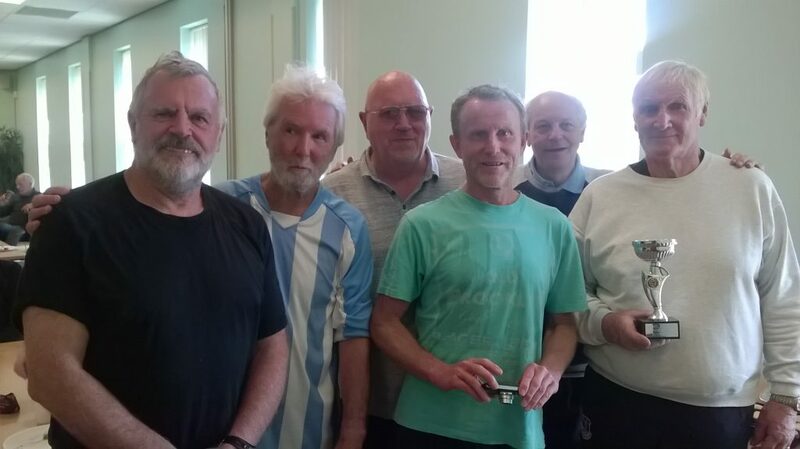 The Rochdale Over 65s Cup June 2017 was a new concept for the Greater Manchester Walking Football League. We were the first in the country to introduce an over 60’s league and possibly one of the first to stage an over 65’s category for a cup competition. 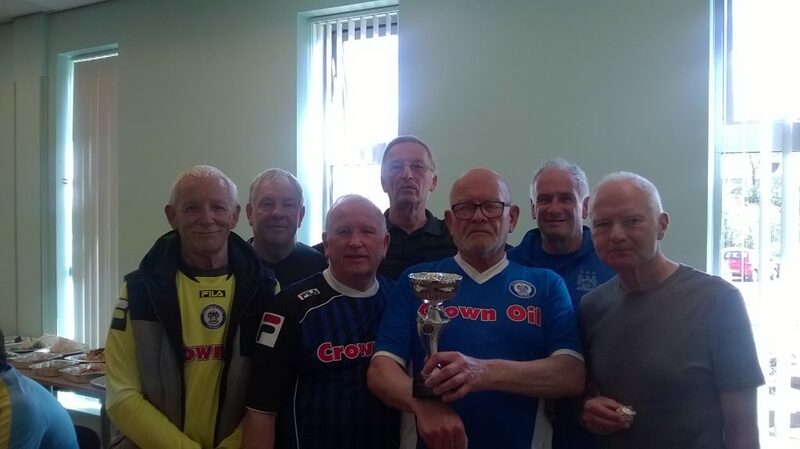 We had 10 teams in total for this Rochdale Over 65s Cup June 2017 tournament, 6 from our own league plus 4 new teams, Manchester Community WF, Tameside Striders, Wakefield Wanderers and Widnes. Most teams seemed to be down to the bare bones, with only 6 or 7 players available. The only exception that I could see was Tameside Striders, who looked to have a full squad of 10. The round robin stage consisted of 5 teams in 2 divisions. Division A consisted of AFC Blackpool Very Senior Seasiders, Manchester Community WF, Rochdale Striders, Vintage Celtic and Wakefield Wanderers. Division B consisted of AFC Blackpool Senior Seasiders, Chadderton FC WF, Rochdale AFC Strollers, Tameside Striders and Widnes. In the 10 matches in the round robin section 20 goals were scored, 10 in each division. There were six 0-0 draws, 4 in Division A and 2 in Division B. The highest scores were two 2-0 victories, one in each division and the highest total number of goals in one match was in the Division A game where Vintage Celtic beat Manchester Community WF 2-1. Vintage Celtic topped the Division A table but second place was a tight affair with both AFC Blackpool Very Senior Seasiders and Rochdale Striders having 6 points apiece, the Blackpool side just edging it on a goal difference of 1. No such problem in Division B with Widnes and Rochdale Strollers out of sight of the rest before they even played their final match against each other. A win for the Rochdale side would have made them top of Division B, with Widnes second. A 1-1 draw meant that Widnes topped the table by a 2 point margin over the Strollers. So it was then on to the knockout stage and the semi-finalists were Vintage Celtic v Rochdale AFC Strollers and Widnes v AFC Blackpool Very Senior Seasiders. I didn’t see the Widnes v Blackpool game so cannot comment on the play but Widnes came out 2-0 winners and looked a good bet to become the cup winners. The other semi-final was my own team, Vintage Celtic v Rochdale Strollers. With Celtic now down to a bare 6, including a crocked player – me, and also our midfield general out with injury, the outcome didn’t look positive. As it turned out the Strollers were better in all departments and the 3-0 victory didn’t flatter them, it was well deserved. I did watch the final and after 5 minutes it looked to me as though this was going to penalties. Both sides had chances to score, with Rochdale perhaps having the better chances but it was 0-0 at the final whistle. So now it was a penalty shoot out, the best of 3 before sudden death. Rochdale AFC Strollers took the first penalty and the Widnes keeper was never going to save this one, so it was 1-0 to the Strollers. Up stepped the Widnes player and his fierce shot brought a great save from the Strollers keeper. Another well taken penalty now made the score 2-0 to the Strollers. This was now squeaky bum time for Widnes as a miss or save meant it was Rochdale’s cup. Another fierce shot was pushed onto the crossbar by the Strollers keeper and that meant that they were the cup winners. A presentation and buffet followed and congratulations to both finalists who were without doubt the best teams on the day. First up for the trophies were the Runners Up, Widnes followed by the winners, Rochdale AFC Strollers. It’s strange how things work out sometimes. Paul and myself, who started the league and also manage our respective teams, Rochdale AFC Strollers and Vintage Celtic, both won trophies. Paul’s team won the cup and mine won the league. Finally, we hope all teams, including the new ones, join us for the Autumn league starting on the 1st September. Details and registration forms will be emailed shortly. If anyone wants links to video, or action shots just ‘Google’ Tameside Striders and explore the menu. The Final is featured there too in addition to games involving ourselves. We enjoyed it and would probably play a part in future tournaments of this nature. A really enjoyable competition, played in the best spirit by everyone. Thanks to all who took part, and special thanks to Bill and Paul. A well written report of the proceedings too! I propose that we do it again in three or four months maybe! Thoroughly enjoyable day including the only dry 2 hour period of the week. Division A was very close, we finished 4th but a goal against Blackpool or Rochdale would have seen us in the knock out stages. Thanks to the organisers, referees and caterers. When was the last time you had a snowball. As Arnie says we’ll be back.